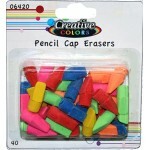 Our wholesale school erasers are sold by the case at affordable prices. Our school supplies are made with quality materials and aren't cheap. Come and see our inventory today maybe you will see something that you like. 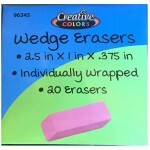 3 Pack Pink Wedge Erasers $0.57 Each. 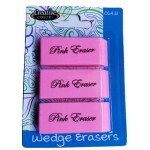 3 Pack Pink Wedge Erasers. Error correcting rubber for students. Case of 48..
3 pk. Glue Sticks $0.62 Each. 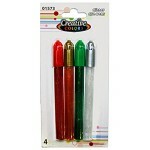 3 pack glue sticks that are perfect for back to school drives.Case of 48..
4 ct. Glitter Glue Pen $0.74 Each. 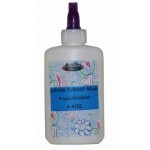 Non-toxic glitter glue pens can be applied on paper, plastic, wood and other surfaces. These sparkli..
Washable school glue in 4 oz size.Case of 48..
40pk Pencil Cap Eraser Safety Warning - Keep out of reach of children under 3 years.Case o..
10 Pack Eraser Caps on our new line of school supplies KOOL TOOLZ.Case of 144..
Elmer's Glue Sticks 7 ct. $1.90 Each. 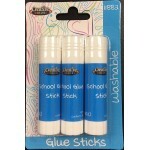 A glue stick is a great adhesive choice if you're working with different types of paper, cardboard, ..
8 gr. 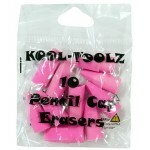 glue sticks on our KOOL TOOLZ line of school supplies.Case of 288..
Large Pink Wedge ErasersCase of 400..